after a well-made 50 runs at the weekend. NEW Norfolk I went down to Rokeby by six wickets in first grade cricket at Clarendon Vale on Saturday. New Norfolk had first dig, making the small total of 112 being all out after 27.4 overs. Batsmen Dave Maddox 39 and Stewart Rice 33 were the only to show any fight during the Red Caps' innings. In reply Rokeby lost the four wickets in the run chase with Rohan Heron picking up two wickets. Josh Walsh took a bashing off one over during his 1-33 off three overs, three consecutive sixes and a few extras. Better luck next week mate. In second grade, Gretna I let a victory slip from its hands going down to Richmond/Cambridge by nine runs at Gretna. Batting first, the visitors were in deep trouble after some good bowling by Corey Ransley, Aaron Maddox and Todd Jarvis had them reeling at 6 for 37. They recovered slightly and were all out for 120. In reply Gretna was doing OK and at one stage was 7 for 101 but failed to give the knockout blow and was all out for 111. Glenn Blackwell played his part with 39 and Ben Rainbird got 22. No other batsman made an impact for the home team. In the other second grade match, Molesworth had a wash out with Montagu Bay at Boyer Oval. 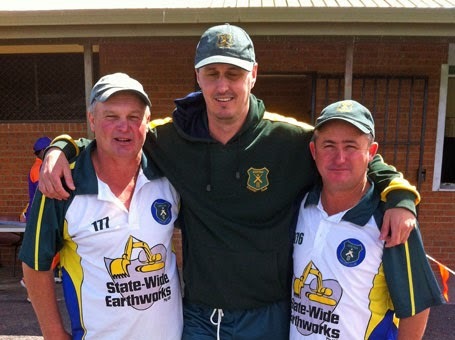 After a close match with Campania, Bushy Park is back on the third grade winners list. Campania won the toss and sent Bushy in to bat. The visitors made the small total of 122, with captain Troy Smith top-scoring with 30 and Mitch Crosswell making 25. Campania collapsed to be all out for 102 as the Grant brothers teamed up with Mitch Crowell to skittle the home side and claim a great win. This was even more highlighted by Bushy Park playing one player short. and Joey Eyles were all amongst the runs on Sunday. In a reduced-over match, Gretna II recorded its second win of the season with a good 21-run victory over the newly formed Weily Park Rockers on Sunday. Gretna had first hit and thanks to some great batting by its senior players they hit up the good score of 204 off 46 overs. Joey Eyles is in top form and made a great 74, while the evergreen Brian Smith showed you're never too old making a neat 50 and captain Damien Hack hit up a solid 44. In reply the Rockers batted well, but just couldn't quite match it with the Gretna bowlers and was all out for 183. All the Gretna bowlers did their bit with the Crosswell twins Luke and Zac leading the way with five wickets between them. Joey Eyles capped off a good day with two and a good catch. Thanks to a terrific century by Jarrod Browning, New Norfolk II secured a big fourth grade victory over Old Beach at Tynwald Park on Saturday. Browning belted 11 fours on his way to 136 and shared a partnership of 175 with Mitchell Rice who also batted well with a very solid 48. The pair set up the Red Caps' big total of 272 off its 50 overs. In reply the visitors were never in the hunt and were bowled out for just 79. All the New Norfolk bowlers bowled well with guest player Damian Tubb picking up 4-21 from 10 overs to be the main wicket taker. It was a solid all round performance by New Norfolk II and the season looks good if this is any indication. In fifth grade, Molesworth II went down to Sandford by 65 runs. The visitors had first dig making 191 off their allotted 50 overs. Josh Ransley with three wickets and Jacksyn Mann with two were the main wicket takers for the home team. In reply Molesworth was bowled out for 126. Youngsters Brett Hodge 27 and Jack Evans 22 showed great fight to be the best of the batsman. Rokeby 4 for 116 off 18.3 overs d New Norfolk I 10 for 112 off 27.4 overs (11 extras) at Clarendon Vale. New Norfolk I - batting: David Maddox 39 (3-4s, 2-6s), Stewart Rice 33 (3-4s, 3-6s). New Norfolk I - bowling: Rohan Heron 2-19 (4.3), Josh Rowlands 1-19 (5), Josh Walsh 1-33 (3). Richmond/Cambridge 10 for 120 off 44.5 overs d Gretna I 10 for 111 off 36 overs (21 extras) at Gretna. Gretna I - batting: Glenn Blackwell 39, Ben Rainbird 22, Todd Jarvis 11. Gretna I - bowling: Aaron Maddox 4-20 (10), Todd Jarvis 3-28 (10), Corey Ransley 2-19 (10), Brock Nichols 1-24 (4.5). Molesworth v Montagu Bay was washed out. Bushy Park 9 for 122 off 44.3 overs (30 extras) d Campania 10 for 102 off 31.2 overs at Campania. Bushy Park - batting: Troy Smith 30, Mitch Crosswell 25, Nathan Grant 11. Bushy Park - bowling: Nathan Grant 3-31 (10), Dylan Grant 3-32 (5), Trent Grant 2-3 (4.2), Mitch Crosswell 2-21 (6). Gretna II 6 for 204 off 46 overs d Weily Park Rockers 10 for 183 off 45.5 overs at Weily Park. Gretna II - batting: Joey Eyles 74 (8-4s), Brian Smith 50 (4-4s, 1-6), Damien Hack 44 (5-4s, 1-6). Gretna II - bowling: Luke Crosswell 3-40 (9), Zac Crosswell 2-16 (3.5), Joey Eyles 2-36 (10), Brodie Gleeson 1-16 (3), Adam Browning 1-34 (10), Tom Gregson 1-37 (10). New Norfolk II 3 for 272 off 50 overs (48 extras) d Old Beach 10 for 79 off 31.4 overs (10 extras) at Tynwald Park. New Norfolk II - batting: Jarrod Browning 136 (11-4s), Mitchell Rice 48 (1-4), T. Smith 22 (2-4s), Damian Tubb 16 (2-4s). New Norfolk II - bowling: Damian Tubb 4-21 (10), T. Smith 2-24 (10), Trent Mayne 1-4 (4), Mitchell Rice 1-4 (1.4), Nathan Rice 1-26 (6). 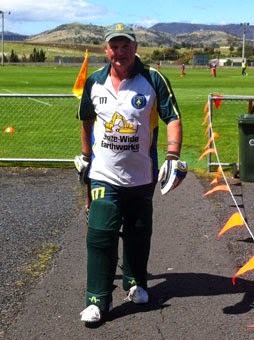 Sandford 9 for 191 off 50 overs d Molesworth II 10 for 126 off 33.2 overs (28 extras) at Boyer Oval. Molesworth II - batting: Brett Hodge 27, Jack Evans 22, Jacksyn Mann 16. Molesworth II - bowling: Josh Ransley 3-30 (10), Jacksyn Mann 2-16 (5), Jack Evans 1-15 (7), Brayden Hodge 1-36 (10), Brayden Chaplin 1-45 (10).